A new hard-hitting play, exploring three generations of male anger to encourage black men to speak out about their mental wellbeing, will premiere at mac Birmingham on Thursday 8 February 2018. Revealed is the first production from the new Menologues platform, founded by The Red Earth Collective to highlight diverse stories of black British men through the arts. It’s goal is to show that seeking mental health support is not a sign of weakness, but a strength. 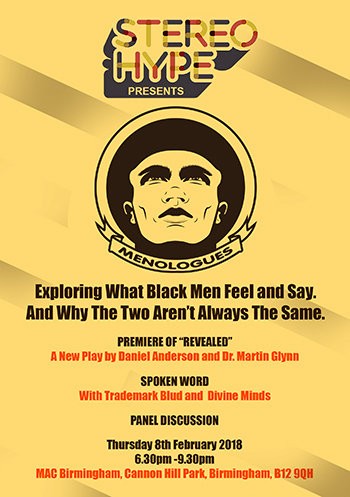 Written by criminologist and author Dr Martin Glynn and Rites of Passage Productions co-founder Daniel Anderson, the 60-minute production explores three black men from the same family: Malcolm, a restaurant owner, his son Luther and Malcolm’s father Sidney, who are locked in room while a violent protest at yet another death in custody rages on the streets. What follows is an edgy unravelling of emotions, where three generations of anger are revealed. The play is inspired by the disturbing fact that suicide rates are at their highest rate for 35 years, with men three times more likely to commit suicide than women. 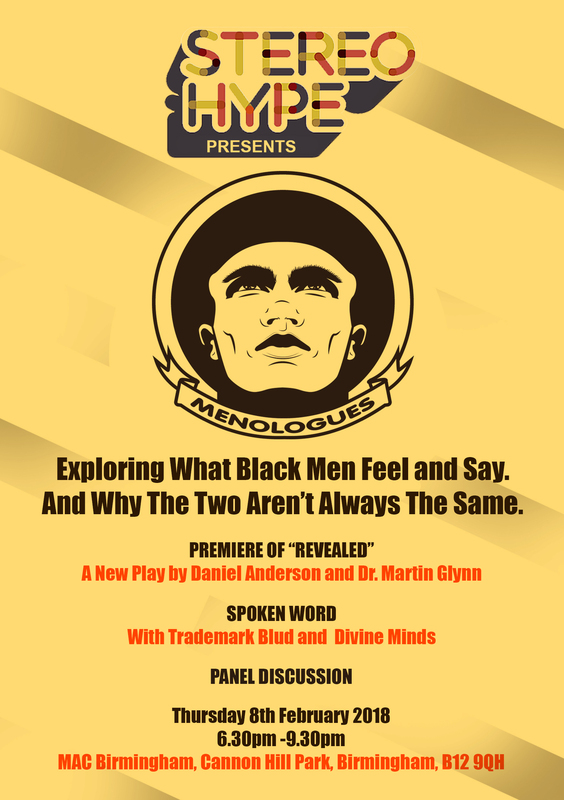 The play will be followed by a panel discussion featuring the writers of Revealed and Themba Loxolo, a West Midlands-based holistic therapist with the opportunity to sign up to the Menologues campaign. There will also be spoken word performances from Trademark Blud and Divine Minds. Revealed plans to tour in theatres and community settings to create a social movement where black men are encouraged to talk more openly when in emotional distress. Cast: Daniel Anderson (Malcom), Thomas Vernal (Sidney) and Dwayne Brown (Luther).